Out of all the International cuisine, I guess Italian and Mexican cuisine is more popular amongst Indians when they want to try something different. Mexican food somewhere resembles Indian cuisine as they make use of a lot of beans, flatbreads and spices. It is vibrant and loaded with flavorful, aromatic ingredients like bell peppers and chilies! Mexicans also love corn and beans cooked in tangy ways, heavily infused with tomatoes, garlic and onions. Cheese is a must-have ingredient for Mexican cooking, used not only as a cooking ingredient but also as a garnish in dishes like Nachos with Cheese, Mexican Cheese Fajita, etc. Oaxaca, the mozzarella of Mexico and crumbly cotija are widely used in Mexican cooking, whereas we have found their substitutes to adapt it to Indian palette. Salads made using beans and corn, teamed up with other ingredients like onions, garlic and lettuce, are a wonderful accompaniment to the main course. 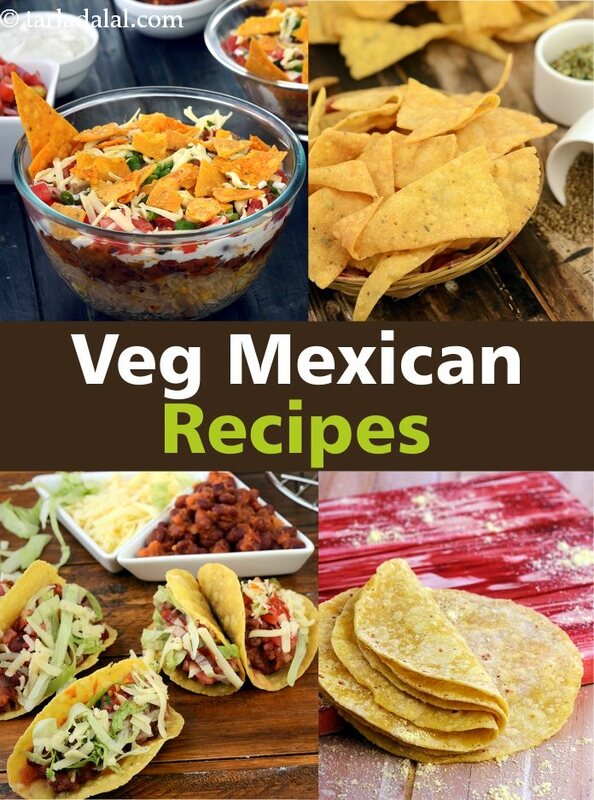 To get a taste of Mexican cuisine, try out Chimichangas, Mexican Fried Rice, Mexican Tacos, Chilli Bean Quesadillas and many more such delightful recipes contained in this section. Master the basics of Mexican food by trying your hands on these simple recipes like Corn Tortilla, Taco Shells, Nacho Chips, Uncooked Tomato Salsa and then cook up an array of Mexican dishes ranging from appetizers to Main courses using them. Just like roti is to India, Tortillas are to Mexico, typically made using maize flour, they can be stuffed with many interesting filling, to turn them into wholesome and lip-smacking snacks that can even replace a meal. If not maize flour, you can use whole wheat flour and refined flour in 1:2 ratio and make a large batch of Flour Tortillas and store them in the freezer for quick use on a hurried day. Similarly, although a little time consuming, you can make Taco Shells in bulk and store them in an airtight container to use as and when required. Crispy nacho chips can either be deep-fried or baked and served along with a cheese dip, Salsa or Baked Beans. They serve as an amazing party snack and also, delightful to kids because they love the ‘chip-n-dip’ concept. The burst of flavours and textures in the mouth is surely appetizing and loved by everyone equally! Other popular dips/ side dish are guacamole, green tomato salsa, black bean dip, layered Mexican dip that go well with tortilla chips. Mini Bean Tacos can not only been served as a party appetizer but also, stay good in the dabba for 5 hours. Perk up the taste with the addition of a Mexican style Pico de gallo i.e an uncooked salsa made from chopped tomato, onion, jalapeno chillies, coriander, salt, and lime juice. Papas Con Queso are Mexican inspired cheese stuffed potatoes. You can even replace them with sweet potatoes and make these yummy starters with its enjoyable texture and exotic taste. Similarly, you can make Stuffed Potatoes with Creamy Mushroom, a beautiful contrast between the crispness of the deep-fried potato cups and the succulence of the white sauce based mushroom mixture. Bring the taste of authentic Mexican food on your dining table, try these Fresh Corn Enchiladas loaded with a scrumptious filling of juicy sweet corn and crunchy veggies in creamy white sauce. Enchiladas are one dish meals and can be filled with a variety of ingredients, including various cheese, beans, potatoes, meats, vegetables or combination of them. Here is a top pick of Vegetarian Mexican Food made at home. Cute, little bread tartlets are filled with a delicious mixture of corn, capsicum, tomatoes and onions and topped with a generous layer of cheese. These tartlets must be eaten warm after they’re baked and the cheese is all molten. A great snack for children! A tasty and filling dish. The coconut and papaya drink is a soothing fruit drink that is ideal for a hot summer’s day! the combination of coconut milk and papaya makes this a cooling drink that is very pleasant to taste and soothes the stomach.